Searching for the right words..
Any of every time filled with such hatred? Could you remember anywhere, anytime no voice of ill-reason was heard, or judgmental thoughts preserve in old structures of family? Backyard cookouts followed by the charismatic aunt and uncle who had way too much to celebrate from the bottom of a bottle. It open thoughts, sometimes conversations that should had never been brought up such as..
Ok, I am sort of going too far and biting the steak instead of the burger. It would seem like people expect things to be a certain way such as— “I have never seen it so it could not be true.” Statements so reckless as the anti-superordinate that can honestly say they would know all situations from their limited surroundings. That would equal a limited mind which has nothing to do with intelligence. Unless having such factors makes you conclude imposed limitations as fact of conversation. I really believe a nation of people must open such eyes that would normally be focus towards mainstream news. It is really hard to get full stories from 1 minute sound bites, or 5 minute interviews. One thing for certain the lack of empathy is staggering to which more would be given to a murderer’s kin than the victims who lost their family from his purposeful acts of terror. I see it as only one could see it from a rational conclusion— “privilege of the so-call elite.” Because having a nice house with mortgage payments and limited stocks with an average middle class bank accounts doesn’t make you a Bill Gates ya’ dig? That privilege won’t save you from the elite who would stomp on your face “O’Brian style” to cement their brand of future. The social classes dividing into the haves and the never wills with laws and attitudes making it a standard and not an abnormally. Now that is a quandary. To be honest I have no answer for something so big—just too much for one person to think of let alone provide action for change. /field trips, or just be a so-call nuisance to the authority on unjust decisions. 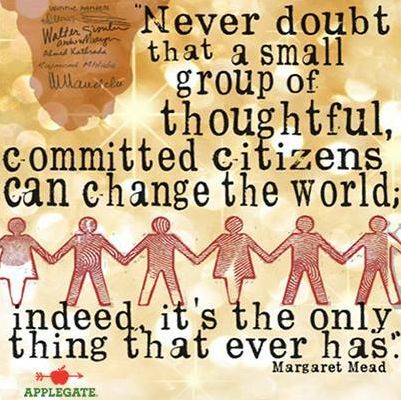 Just be a citizen of change. The human capacity for evil is enormous. Did we not know that? Our capacity for love and creativity is enormous too. Sometimes we deny that too. Hatred flourishes when apparent certainties are crumbling. That can be when an old structure and culture is crumbling (political murders in the USA in the fifties and sixties, Europe after the First World War). It can be when there is just too much information, noise, change, confusion, diversity, hope, fear for many people to handle, so they turn to racism or to IS. These things are simple. But many people with hate in their hearts, in many countries, don’t have guns, because it would be illegal, and don’t have the contacts to get them. Saving lives is a matter of practicalities as well as of love.